Very well done. Looks almost real. I like ducks. Ducks are fun. He's very happy to hear that..
You did a really nice job on the ducky Poppa, I love ducks. They're so sweet... 'cept when you're feedin a flock of them bread crumbs and run out... lol still cute though even then. Very nicely done Dave! I like the texture :) Duck-eh! wonderful Dave. A critique if I may: If you are going for realism, I think your colors are a little on the bright and cartoonish side, and should be toned down slightly. Sorry, I was channeling Bugs for a minute. You'll be hearing from my laywers, CV. Hehehe.. I never did art school, either.I know what you guys are saying, but..that green looked pretty close when I did it. (still does, to me...but I guess it's not). It looks fine to me.. a mighty close match. of "blue out of the tube" (if you know what I mean). Moot point if you dont see what I mean, though. Dave: No I think the last version is better. 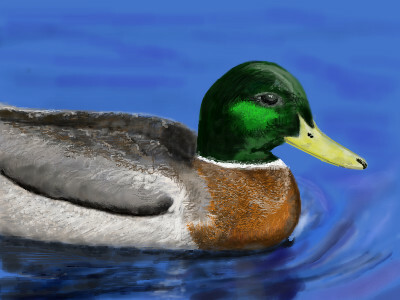 The point I was trying to make was more about your general pallette, and not specifically about the green on the duck. it are grey undertones as well. I think that its a pitfall of painting with this medium. A certain opaqueness is hard to achieve with RGB. Youre correct in that this could be a monitor display difference... I dont know. I hope my comments are helpful. Thanks! I haven't had any art training, so I just kind of "wing it"(no pun on the bird pics intended)..I appreciate your advice, and I admire your work very much. I am an art teacher so hope u don't mind my 2 cents. My own hand and eye are very rusty on my work since I teach and don't make my own art much. I doodle around at Youdraw..i like black and white and the cjhallenge of the poor tools and stupid lil box. *L* This site is a bit overwhelming to me! Awe, Very cute. Nice draw mate. Hey Poppa! I just stopped by your portfolio to check it out. Wow! This duck is fantastic! How do you find time for life between here and doodlebug? Thanks...I have a lot of fairly sleepless nights.. so.. I come here.. or there.. or both..
Whoa, dave...I think this is definitely one of my favs of yours! Beautiful, just beautiful. Great job! you are so talented poppa. the water is awesome and the duck on top of it is superb!